Here is a recipe for the Chicken Sausage and Peppers that I make for my family often. It is quick and easy to make. My family loves it and using the chicken sausage instead of regular sweet sausage makes the recipe less fatty and healthier. In a large pan saute peppers and onions in olive oil for about 5 to 10 minutes. Add chicken sausage and cook everything together for about 15 minutes until peppers are cooked soft. For a side dish you could also serve this with any type of rice that you like. Try this out it is so good and your family will love it! My husband would LOVE this! Visiting from Friday Food Frenzie. I love sausage and peppers - your sausage looks so good! Thanks for linking up to Friday Food Frenzy! Hi Jacqueline, this recipe is so good and let me know how it come out. 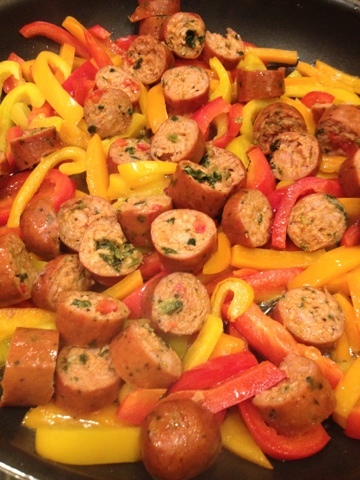 I love your combination of Chicken Sausage and Peppers for this dish, it looks so good! Hope you are having a great day and thanks so much for sharing with Full Plate Thursday.